Stopping Points: No set points but some interesting things to see are listed in description below. 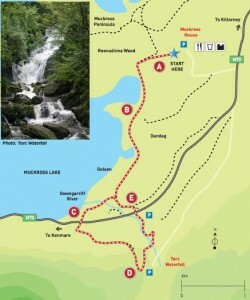 Car Parking: There is a parking area located in Muckross House at the start of the trailhead. Disclaimer: Gems Publishing Ltd. do not accept responsibility for injury, loss or inconvenience caused while walking these trails. Common sense should prevail at all times. 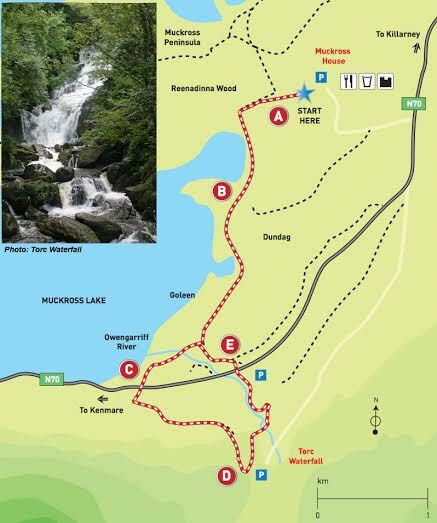 Before you start: Start from Muckross House, only 6 km/3.6 mi from Killarney town centre, along the main Kenmare road (N71). History to know: Torc waterfall derives it’s name from the Gaelic word ‘torc’ meaning a wild boar. According to legend the waterfall was created by a man who had been cursed by the Devil to spend each night transformed into a wild boar. He lived in a cavern beneath the cliffs of the mountain. His secret was discovered one night by a local farmer out looking for missing animals. The boar offered him great riches not to reveal his secret but became furious when his plight was revealed. In his anger he is said to have burst into a ball of flame and disappeared into the Devils Punchbowl lake on nearby Mangerton Mountain. The lakewater burst forth and created the waterfall to hide forever the Boars cavern beneath the waterfall. A to B: Leaving Muckross House the track turns sharply to the left with panoramic views of the mountains and meadows. Keeping to the left and situated on the right hand side is the notable landmark of the Old Boathouse – home for centuries to the many rowing and fishing boats on the lakes. From here one can take the short but spectacular Old Boathouse Trail which includes the scenic limestone cliffs of Dundag Point with its splendid panorama over the Muckross/Middle Lake. 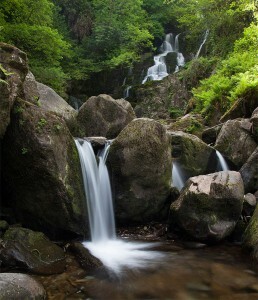 B to C: You’ll climb steadily through the trees to cross the Owengarriff River, just above the main falls. C to D: A series of steps leads you back down through the woodlands on the eastern side of the river to the viewpoint of the 18 m high Torc Waterfall cascade. D to E: The trail continues to the N71 which you will need to cross. Keep left along the path to rejoin the Lake Loop to return to the car park at Muckross House. E back to A: Known locally as “Springfield,” this pleasant path runs parallel to Muckross Lake and the lovely sandy Goleen Bay which is popular with bathers. Also one can see the distinct and fully black breed of the Kerry Cow grazing in the fields which is unique to the Muckross Estate and County Kerry. 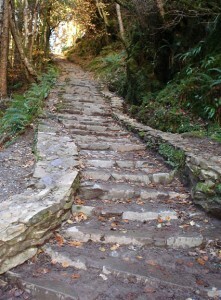 The path runs all the way to Muckross House with the option of visiting the magnificent Sub-Tropical gardens. Finish: We hope you have enjoyed the walk and found the information here useful. As always, if you have any comments to make please contact us at info@kerrygems.com.